Q: I have a lot of leaves blowing into my pond. Will the bacteria still work this time of year? A: Leaves. There’s really no getting around them. Every fall, those deciduous trees drop their colorful foliage and leave behind a headache for those who have to clean them up. Natural bacteria will do a great job breaking down the fallen leaves in your pond or lake – but only when water temperatures are above 50° F. Take your pond’s temperature with a pond thermometer; as long as your water is at or above that 50° F mark, keep using MuckAway™ and PondClear™. The microorganisms in those products will continue to work hard to break down organic debris. Going into winter as temperatures dip below that number, however, the bacteria go on vacation. But there are some things you can do to keep your pond healthy as the cooler weather approaches. Here’s what we recommend. Rake Up the Leaves: As powerful as natural bacteria are, they will still take a long time to break down fresh leaves that blow into your pond. Help those microorganisms out by raking up and disposing of as many leaves as possible. Rake Out the Leaves: If they do float into your pond, use a Pond & Beach Rake or Weed Raker to skim and rake those leaves out of your pond. If an abundance of leaves remains in the pond as ice begins to form, this could lead to poor water quality. As the leaves continue to break down, they will release toxic gases that will edge out available oxygen – and if there is ice covering your pond, that’s bad news for your fish. Aerate All Winter: Unless you plan to use your pond or lake as an ice rink this winter, keep your aeration system running. This will help keep a hole in the ice, circulate the water and keep your oxygen levels higher. Maintain Your Landscape: In addition to raking up leaves around your pond, keep the foliage around your pond maintained. Prevent that organic debris from getting into the water and turning into algae and pond weed fertilizer. Bottom line: Yes, bacteria will still work while temperatures are above 50° F, but help them out by removing as much leaf litter and organic debris as possible. There’s no way to fully prevent leaves from falling into your pond – but the fewer that do, the better. 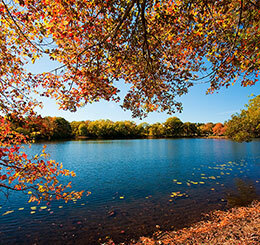 Pond Talk: Have leaves started falling in your neck of the woods yet? Join over 60,000 fellow pond owners and receive our Weekly Pond Talk every Saturday. Q: I know a net won’t fit on my pond, so how do I keep the leaves out? A: Big lake? Blowing leaves? No problem! Though it might seem like an impossible task to keep those drifting fall leaves from landing in your pond or lake, it is possible to manage them even without the use of pond netting. With a little bit of planning you can use this three-step solution. Here’s what we recommend. No, your aerator won’t blow away debris like your leaf blower, but it will help to circulate oxygen throughout the water column. An Airmax® Aeration System will keep your pond or lake healthy by removing dangerous gases like ammonia while delivering O2 to your fish and muck-eating beneficial bacteria. Continual use of some beneficial bacteria like those found in Pond Logic® MuckAway™ throughout the fall will help decompose the leaves that have landed in your lake or pond. The bacteria-packed pellets sink below the water’s surface and instantly begin to digest muck, gobbling through leaves and improving water clarity. Pond Rake: Perfect for mechanical control of weeds, algae, muck and debris, this 3-foot-wide aluminum rake comes with an 11-foot two-piece rust-proof powder-coated aluminum handle, detachable polyethylene float and a 20 feet length of polypropylene rope. Heavy Duty Pond Net Combo: This heavy-duty handheld net includes a fish net, sludge/utility net and aluminum neoprene-grip handle that extends to more than 9 feet. The quick-change design makes switching between nets fast and easy. PondSkim™: Remove floating debris quickly by dragging this skimmer across the surface of the water. It measures 5 feet wide and is constructed with a tough collection screen, a buoyant float, a sturdy abrasion-resistant lower crossbar and a 24-foot pull line. It can be a challenge to prevent leaves from settling in a large pond or lake, but with a little planning and hard work, it can be done. Good luck! Pond Talk: If you have a large pond or lake, what do you do to prevent copious amounts of leaves from landing in it and turning into muck? 2-in-1 Pond Net: This heavy-duty handheld net includes a 4-foot aluminum neoprene-grip handle that extends to more than 11 feet. It also comes with a 14-inch interchangeable net frame that supports both a durable ¼-inch mesh fish net and ultra-fine skimmer net. Join over 50,000 fellow pond owners and receive our Weekly Pond Talk every Saturday. Q: I need a net to protect my pond from leaves. Which one works the best? A: Colorful fall leaves are beautiful, but once they start falling, they can be a hassle—especially when you have a backyard pond. When they drop into the water, they turn it into leaf tea, add to the nutrient load, and as they break down, build up as muck on the pond bottom. What types of leaves are you battling? If you have trees with small needles or leaves, like locust or pine, you’ll need a small mesh net — like Fine Mesh Netting — to catch all those tiny needles while still allowing sun to shine through. If you have larger leaves, like maple or oak, go with a stronger net that can handle their weight, like Premium Protective Netting. How concerned are you about your water garden’s aesthetic appeal? If you want something that will shelter your pond while allowing you to enjoy the view, check out some Economy Netting or Premium Pond Netting. They’re both easy to install, and they won’t block your view—but you will have to keep the leaves cleaned off to prevent the net from sagging. If you have a heavier leaf load, however, you might require a stronger net, like one of our Pond Cover Nets. Your view won’t be as naturalistic, but the net will protect your pond and reduce your extra fall chores. How long to you hope to use the net? Sometimes, a quick-fix, inexpensive solution is what you need. In that case, plastic Economy Netting designed for single-season use fits the bill. Cover your pond for the season, and when the snow starts falling, remove it and toss it. If you’re looking for something you can use season after season, however, consider Premium Protective Netting or netting with sturdy framework. It might cost more initially, but its durability will pay for itself in the long run. With several different netting options there is one to fit just about any pond owner’s needs, choose one that’ll keep your pond leaf free. Pond Talk: What kind of net do you have on your water garden? Q: Do I need to put a net over my pond? A: With fall approaching, we’ve been talking a lot about why and how you should cover your pond with a net. A net’s purpose—to prevent leaves and debris from landing in your water garden and decomposing into muck—is fairly obvious, but is it a requirement? Nope. Just because you have a pond doesn’t mean you need to cover it with a net. When considering whether you should add one to your fall prepping kit, first take a look around. Is your yard (or your neighbor’s) filled with deciduous trees or needle-dropping conifers? If so, you will need to cover your pond with The Pond Guy® Fine Mesh Pond Netting or The Pond Guy® PondShelter™ to protect it from the falling leaves and needles. Pond Netting: Made with clear, heavy-duty 1/8-inch mesh in a variety of sizes to fit most ponds, the Fine Mesh Pond Netting will keep your water garden protected from small, stubborn debris like pine needles while still allowing for sunlight penetration and aesthetic enjoyment. It comes with plastic stakes to keep it in place. PondShelter: In addition to its 16-foot-by-11-foot swath of ¼-inch mesh netting, the PondShelter™ Kit includes a fully adjustable aluminum frame that easily adjusts to most landscapes, along with 30 metal stakes to keep it securely in place. If your skies are clear from leaf- and needle-dropping trees, you don’t need pond netting—but you will need to pull out your 3-in-1 Interchangeable Pond Tool to manually remove any leaves and debris that do land in your pond. Even if you have no trees in your yard, stragglers will inevitably blow in, and so you should be prepared to fish them out with this handy-dandy telescoping tool. Whether you need a net to shelter your pond or a handheld net to manually remove debris, make sure you keep yourself covered by using Seasonal Defense®. The beneficial bacteria in this cool-water product will go to work breaking down any muck that does wind up building up. Pond Talk: What tips do you have for new hobbyists fitting a net onto their pond for the first time? Questions Not Answered? ASK The Pond Guy!